For the Month of July I read 6 books! I have to say, it was a good reading month. I enjoyed all the books I read. And especially the books I REread: Dragonflight, Dragonquest and the White Dragon. 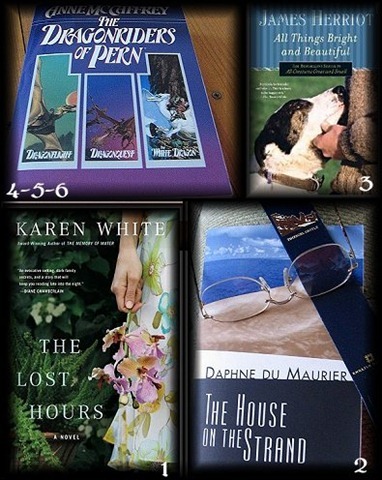 I have come to enjoy Karen White’s writing and of course Daphne du Maurier, and James Herriott is just so enjoyable and calming that I would be shocked if someone didn’t like his books. 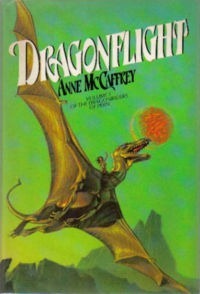 Then of course there is Anne McCaffrey. She wrote many more books about Pern and the dragons and people of Pern but this first trilogy and the Harper Hall trilogy and the separate book on Master Harper Robinton are my favorites. But I wouldn’t have “not read” any or her Pern books. It’s like going home. 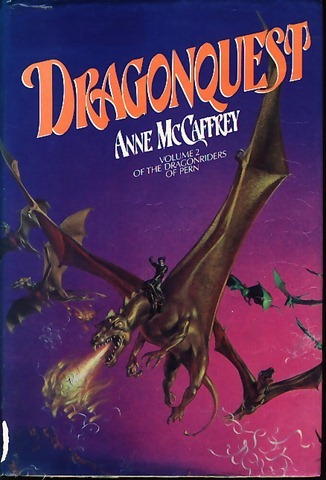 I was so sad when Anne McCaffrey passed away, knowing the person who’s wonderful mind made the most fabulous characters and most unforgettable dragons in the world had gone “between”. I will be forever grateful that long ago, I had the opportunity to meet the grand lady at a convention. It saddens me to realize that of the four authors I read this month, only one remains to write more books for me to read. But I have yet to read all of Daphne du Maurier’s books. I think my next of hers (when I can find it) will be Frenchman’s Creek. 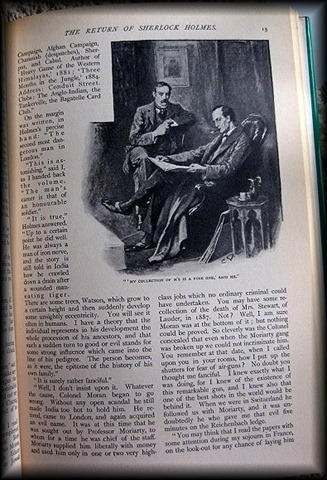 It seems I have a love for books that take place in England.. especially older books. So.. that is it for me for the month of July. I am having a hard time letting go of Pern to get myself involved in another book yet so August may not prove to be one of my better reading months! Until then… Happy reading to everyone! 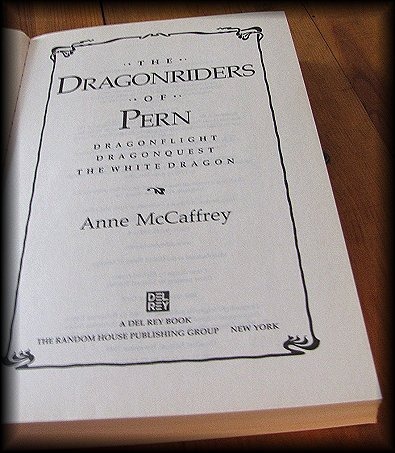 The Dragonriders of Pern by Anne McCaffrey. The White Dragon is the coming of age story of Jaxom, the young Lord of Ruatha Hold, who had accidentally impressed the unusual white dragon, Ruth in Dragonquest . As Jaxom grows up, he has to deal with the difficulty of being both a Lord Holder and a dragonrider, the maturity of Ruth (who, besides being white, is a runt), his own teenage angst and desire to fight thread on his own, and the rebellious oldtimers, who attempt to steal a golden egg from Benden Weyr. Fortunately, Ruth always knows when he is and can travel through time to avert the growing political crisis. But while fighting Thread, Jaxom falls ill with a potentially deadly sickness called "Fire-Head". This leads him to recuperate in Cove Hold, and while there he discovers some of the mysteries that the Ancients, the ancestors of the Pernese, left behind, and he begins to make more sense of the past. 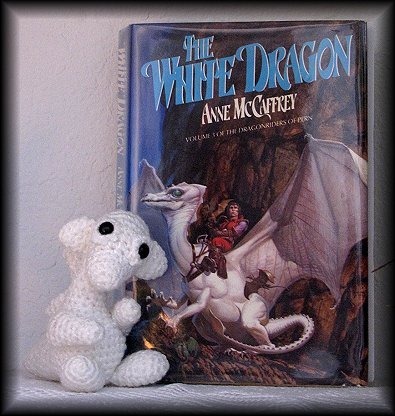 The White Dragon by Anne McCaffrey. 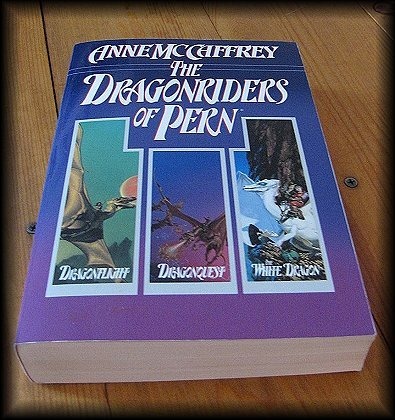 As far as I am concerned there is no better books then the Trilogy of the Dragonriders of Pern by Anne McCaffrey. Her final edition to the story, The White Dragon, makes the full circle of Lessa saving Ruatha and then saving Pern from threads and all the while discovering the entire planet for the future of all the people of Pern. The White Dragon seems to be the favorite book from the trilogy but I see the 3 books for what they are… one story. Book 1 begins with the birth of Jaxom and book 3 finishes with Jaxom grown and becoming Lord of Ruatha. These books are among the very best for characters and for a story, it just doesn’t get any better. There are few in life that are fortunate enough to be able to say they have written something that will last the test of time …but in these books Anne McCaffrey has done just that. Her visualization of the Dragons, their personalities and abilities set the tone for many future books by others that use dragons in such a large capacity as Anne does in these books. The dragons are every bit as main character as the people are…and more. I hope others read these books and get to experience the bonding of dragons and humans and I dare you to say that it doesn’t emotionally effect you! Read these books. You owe it to yourself to read some sci-fi/ fantasy that will remain with you forever. I no sooner stepped out of my car and began my way to the store when I was passing a man and wife, complete strangers, unloading their bags into their trunk of the car. I went right up to her and we hugged! Her husband raised his eyes to the sky, unbelieving. We stood and chatted a few more moments until their packages were all safely in the trunk of their car. 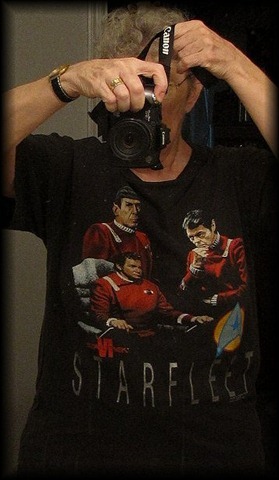 “He tolerates, Trek” she said. “Ah, I see, “ I smiled. “But at least he is tolerant” she said in his behalf. “Much better than no tolerance,” I grinned. What a good feeling to have hugged a stranger! I do miss conventions for this very reason! Seven turns have passed since Lessa brought the Oldtimers (dragonriders from the end of the last fall of Thread) from 400 years in the past to present day. At first, most were grateful to still be considered useful. Now, a select few are becoming more and more unruly, and some of them are Weyrleaders. The people in the holds are letting their felling be known and relations between Weyrs and Holds are breaking down. Only Benden Weyr and Southern Weyr seem to show respect for all of Pern, and F’lar, the Benden Weyrleader, realizes that a boiling point is fast approaching. Top this off with thread falling out of schedule, the hot-headed Weyrwoman Kylara stirring up trouble, fire lizards being found and impressed, a new way of speaking over long distance, and ideas of attacking the Red Star itself, F’lor and Lessa are at their wits end. Seven years has gone by when you begin book 2, Dragonquest. Benden Weyr has learned a lot about protecting Pern, but the Oldtimes tend to stick to what things were like 400 turns ago and some refuse to try to change to the “new surroundings”. Things are definitely not going as well as expected. Tensions run high. New cave rooms are found with “old instruments” which become useful, new characters are introduced, a love story unfolds, and the Red Star looms ominously above sending threads in new and different patterns. F’lar and Lessa continue to try to hold things together but problems keep arising. This book also contains fighting queen dragons… unheard of before. As always I don’t like to say too much because this trilogy is my favorite books of all time and should anyone decide to discover them I wouldn’t want to have given the whole story away. Today I will begin the longest of the three books, The White Dragon. Although I’ve read these books a number of times I find much of the reading fresh and at the same time smile as I remember what’s next. If you like dragons with personalities. If you like a planet *similiar* to Pandora… you will love these books! 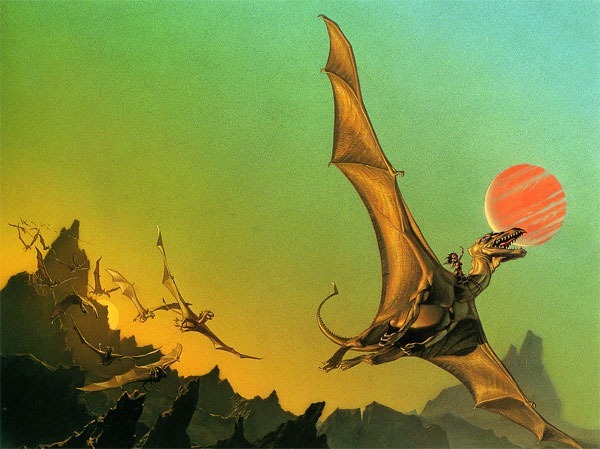 Anne McCaffrey’s Pern is one of the most memorable worlds in science fiction and fantasy. Humans and their flying dragon companions live in fear of thread, a caustic, deadly material that falls sporadically from space. But when the thread doesn’t fall for a long time, people become complacent, forgetting that it is the brave dragonriders who can save them from the periodic threat. But when the thread falls, human and dragon heroes must fight the scourge. This edition encompasses the first three unforgettable novels of McCaffrey’s epic series: Dragonflight, Dragonquest, and The White Dragon. As many know of me.. 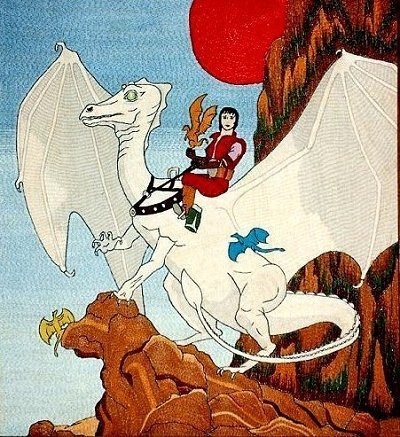 I have 2 great “loves”: DeForest Kelley and The Dragonriders of Pern! I am not even sure how many times I’ve read this trilogy but my guess is “above 5 times”. You’d think that I’d know the dialogue by heart… but I am old and my memory is far from "sharp”. I had even forgotten just how much happens in this first book, which is the shortest of the three novels. Anne McCaffrey has written the perfect books to be listed as: Sci.fi/ Fantasy, for surely they are both. It takes place on a planet that is not earth, yet the humans are indeed from earth. There are lordholders, craftholders and there are dragonriders and those that wish to be one or the other. And of course there are the wonderful dragons that are as much (if not more) of the leading characters in the books. In book one you learn of the dangerous spores (threads) that had long ago, fallen on Pern and killed anything they touched. You learn much about the dragons and their riders and how they become dragonriders by impressing a newly hatched dragon. Ahhh, the hatchings, a part of the Weyrs that you wind up wanting to see yourself. Also in book one you learn of the Holds on the planet and the holders and all the crafts from those that can invent things to the Harpers that sing the old tales which tell about Pern of the past. There is just so much with this first book and I don’t want to give anything away because Carl of Stainless Steel Droppings may be doing a read along of this book next month…but if he doesn’t my suggestion is that if you love adventure and dragons and romance and just out of this world characters… then you should read this book and the two others that follow! The second printing of the books come with fabulous covers painted by Michael Whelan. In 1996, McCaffrey sold the motion picture rights to an Irish company, Zyntopo Teoranta, who entered into a co-production agreement with Alliance Atlantis , covering development including advanced 3-D animation and compositing effects for television budgets. Distribution pre-sale efforts failed, and Zyntopo Teoranta entered into an agreement with Ronald D Moore as show runner to present the project to Warner Bros. Network. In 2002,Warner Bros. Network and writer Ronald D Moore had completed sets and casting for a pilot episode, and were within a few days of filming. Moore had sent the pilot episode to Warners for final approval. It was returned with so many changes to the basic structure of Pern – making it more like Buffy the Vampire Slayer – that it no longer much resembled the world created by Anne McCaffrey. As a fan of the Dragonriders of Pern series, Moore refused to continue. Filming was canceled, and rights ownership remained with Zyntopo Teoranta’s assign, Kua Media Corporation (Canada). In May 2006, it was announced that rights to the entire Dragonriders of Pern series were optioned by Oscar-winning production company Copperheart Entertainment, Copperheart announced their intention to bring Pern to the big screen. On 12 April 2011, Copperheart announced signing David Hayter as screenwriter and Don Murphy as executive producer for a film version of Dragonflight, with production expected to begin in 2012. 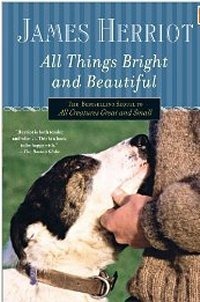 All Things Bright and Beautiful by James Herriot. The Yorkshire veterinarian who has captured the heart of America with his beloved and wonderful autobiographical books here presents his best-selling sequel to All Creatures Great And Small. Bursting with warmth and laughter, you will fall in love with James Herriot’s very special celebration of life. If you ever need to be reminded how wonderful it is to stop and smell the roses even though your life is fantastically rewarding… this is a book you should read. Actually is the second book to a series that Herriot wrote about becoming a country doctor for both big and small animals , his experiences, his neighbors and customers, his love of animals.. and the love of the countryside that he is lucky enough to be working in. They are the love of life and all that goes with it.. If you need a calming effect on your life grab the first book “All Creatures Great and Small” and begin reading. It’s everything you wish life could be. However… heh.. if you are squeamish hearing how he puts his arm in to help birth a cow… there might be a few parts you will skim over…but they aren’t too descriptive. I could never write what these books are really like. All I can say is that he writes about his life becoming an animal doctor and his experiences with both the animals and the people who own them. He was a man with 2 careers… first and foremost he was a Veterinarian and second he was a damn good author! … and the fantastic art work on nearly every page! 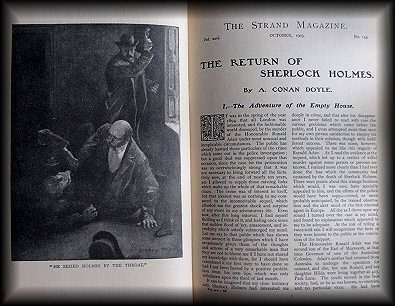 All by the original artist Sidney Paget! Is that neat or what?!! I had to have it! The Chances of my reading this copy isn’t great though because of the small print.. but I still had to have it! Cost: 3.oo. And then I found a book I look for every time I go there… and this time I found it! 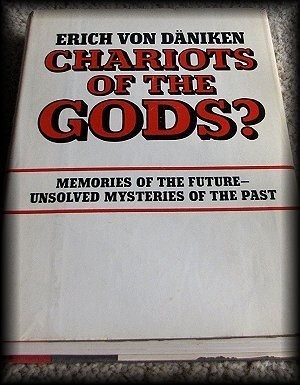 Chariots of the Gods by Erich Von Daniken. I still have my old OLD paperback which I can’t read anymore from small print and brown paper! 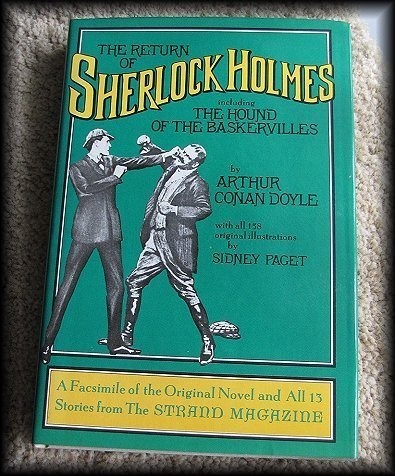 I was thrilled to find this hardback copy in very good condition! The cover is beginning to brown on the edges but the inside is still very good! Sometimes something very cheap can make me quite happy! Cost: 1.oo !!! 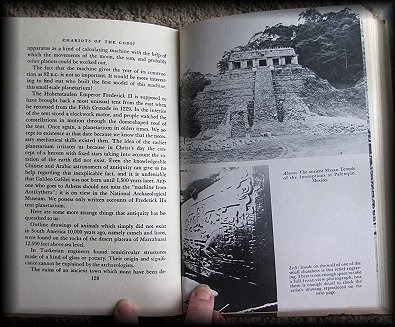 So, has anyone else found any special (hard to find) books lately??? ?